Eire Og and Cill Na Martra go head to head in Macroom in the Cork County PIFC round 1 Sunday. The men from Ovens will be hoping to keep their first round record of never losing a first round game since coming up from junior in 2008 in tact. Both sides had a decent championship last year. Eire Og lost to St. Michael's at the semi-final stage in a game they looked well in control of after Jack Murphy's goal with 20 minutes to go. Cill Na Martra had a great year beating Aghabullogue in the Intermediate final in October. Eire Og are off the back of winning the U21 Mid-Cork two weeks ago against Ballincollig and should have a number of that team starting. John Cooper and Murphy are certain starters at centre forward and midfield and Diarmuid Dineen could make his championship debut at wing back. Former Cork Minor and U21 footballer John Mullins is at full back with Dermot O'Herilhy at centre back. Up front they have former All-Ireland winner Daniel Goulding at full forward and Cork senior footballer Ronan O'Toole on the wing, although the returning Kevin Hallissey is a doubt due to injury. The Gealtacht side have the bulk of the team that lost the U21 footbal county final to Douglas in 2017. At the back former Cork senior Nollaig Ó Laoire is at centre back, former Cork U20 football Tadhg Ó Corcora is out due to injury. Micheál Ó Deasúna is at midfield and up front they have the three Ó Duinnin's Ciaran, Daniel and Shane who are lightening fast and lethal in front of goal. Both sides have had a mixed league campaign to date. 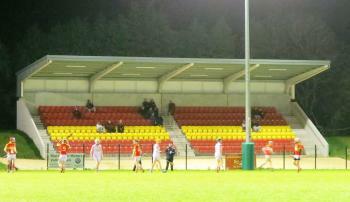 Eire Og are in division 2 of the league and are mid-table with 2 wins and 2 defeats from 4 games. They beat Clyda Rovers and Carrigaline while losing out to Newmarket and Fermoy. Cill Na Martra in division 1, also with 2 wins and 2 loses from 4 games. Their two wins game against St.Michael's and Carbery Rangers while the two defeats came against O'Donovan Rossa and St. Finbarr's. With the more experience at this grade and coming in on a high after the U21 success I think Eire Og will just come out on top in what should be a close affair.